The new CSA methodology for calculating risk ratings for mutual funds and exchange-traded funds (ETFs) had the objective of standardizing risk rating across the industry. My earlier research indicated that 28% of funds with at least 10 years of history have a projected risk rating that is different than their current risk rating. While that result was somewhat expected, the bigger surprise was that there are more funds that could potentially lower their risk rating based on the new methodology than funds that will be forced to raise it. In my earlier research, I hypothesized that risk ratings could decrease even more over the next few years as the volatility experienced during the financial crisis in 2008 begins to fall out of the 10-year standard deviation (SD) calculation. I wanted to explore this idea further and look at how the 10-year SD will change, and how this could affect risk ratings under the new CSA methodology. We will start by looking at the historical volatility figures. The chart below shows the average 1-year and 10-year SD going back 30 years. The universe includes only funds with a 10-year history and excludes money market funds as well as Passive Inverse/Leveraged ETFs. The first thing to notice is that the 10-year SD is much more stable than the 1-year SD. Despite this fact, you can clearly see the effect that periods of extreme volatility have on the 10-year SD. This effect can be seen at both the beginning of a volatile period as well as 10 years after the volatile period has ended. For example, in October 1987, the 10-year SD jumped to 13.9% from 12.8% in just one month. This was due to the “Black Monday” market crash on October 19, 1987, when equity markets fell more than 20% in one day and funds lost an average of 13.2% for the month. This extreme one-month return can be seen at the bottom of the chart and is responsible for the entire 1.1-point increase in the 10-year SD. The opposite effect can be seen on the other side of the calculation. Ten years later, when this month drops out of the calculation, the 10-year SD falls to 9.9% from 11.1%. A few years after this, in August 1998, the Russian debt crisis caused funds to lose an average of 12% in one month and the 10-year SD to jump to 10.6% from 9.9%. Then in August 2008, one month before the credit crisis would result in funds losing an average of 10% for two consecutive months, the effects of the Russian debt crisis fall out of the calculation, and the 10-year SD declines to 12.3% from 13%. The drop would be short-lived, as the figure rose back to 13.1% by November 2008 and to 13.5% by August 2009, its highest level in over 20 years. Which brings us to today. The 10 year SD has been steadily falling for the past eight years and now sits at 11.5%. Looking at the chart, you can see that the 1-year SD has not been above the 10-year value since early 2010. 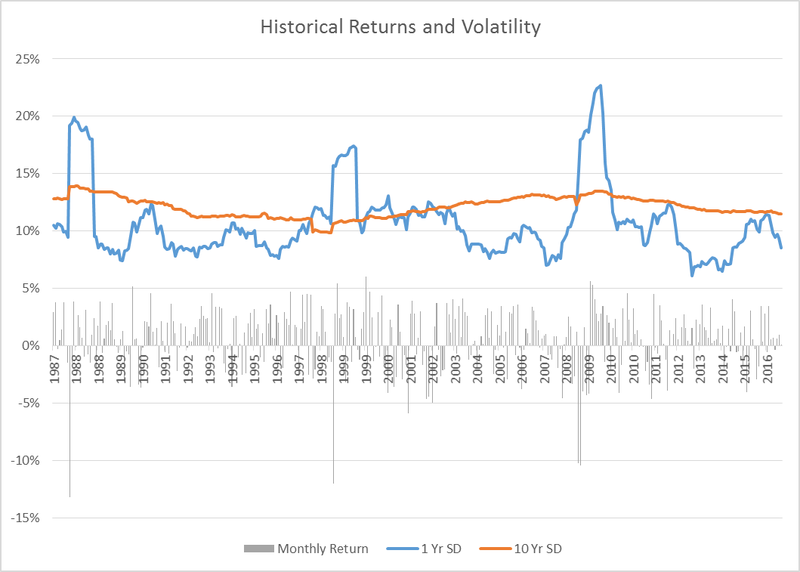 Once the volatility we experienced during the financial crisis drops out of the calculation, assuming we do not experience another spike in volatility (more on that in a minute), the 10 year SD will decrease rapidly. This has the potential to significantly alter risk ratings that will be using the new CSA methodology starting this year. Let’s project the 10-year SD over the next two years. If we assume that volatility over the next two years reflects the average volatility we have experienced over the past 8 years, we can use the 8- and 9-year SD values as a proxy for the projected 10-year SD figures. Using this assumption, the table below shows the projected 10-year SD values over the next two years. The first thing you will notice is that the projected figure at January 2018 is slightly higher than the current 10-year SD. However, this is not all that surprising when looking at the historical graph, because the period of extremely low volatility leading up to the 2008 credit crisis falls out of the calculation. The change that is projected over the following year is much more dramatic. 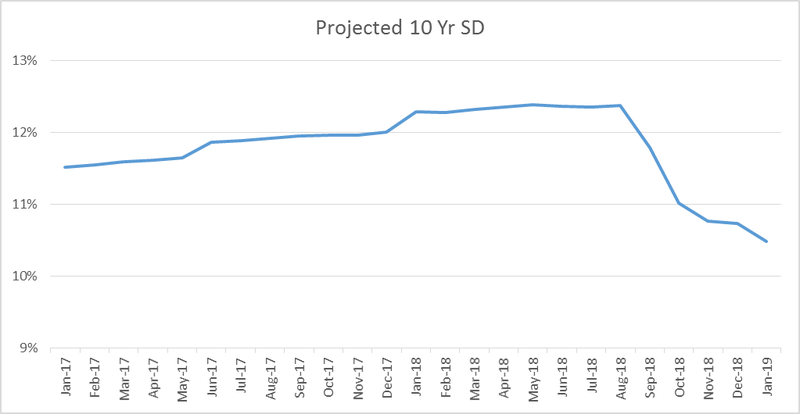 The projected 10-year SD at January 2019 is just 10.5%, almost 2 percentage points below the value projected at January 2018. Interestingly, this entire change will occur during the final five months of the period, with the largest decreases occurring in September and October of 2018 when September and October 2008 drop out of the calculation. The graph below shows the projected 10-year SD for the next two years. Assuming that volatility will remain steady for the next two years may seem like a stretch to some observers. But even if this scenario were to play out, the average 10-year SD would still be above its low point over the past 20 years, which was set in July 1998 at 9.9%. While this scenario may seem unlikely to materialize, it would not be unprecedented based on historical trends, so we cannot completely discount the possibility. Now let’s look at how these changes might affect risk ratings under the new CSA methodology, which uses fixed SD bands to assign risk ratings. Assuming the projected SD values play out, the percentage of funds that could potentially change categories will not differ significantly over the next year when compared with my previous analysis. 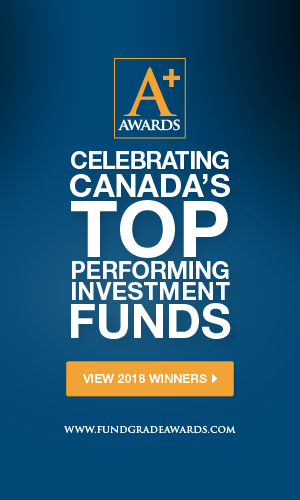 By January 31, 2019, however, the total percentage of funds that could potentially change categories would increase to 49%, with an astounding 97% of these – or more than 700 funds – potentially moving down at least one risk band. And if we extrapolate over the entire universe of funds, this number could easily double. It is also worth pointing out that the past two major market crashes have been preceded by periods of extremely low volatility. In both cases, the 10-year SD dropped significantly leading up to the event. Whether this is just coincidence based on the limited time frame of this analysis or whether it highlights a drawback of measuring risk using SD with fixed risk bands, we should not overlook the possibility that risk ratings could potentially be decreasing just as the risk of a tail event is at its highest. Brian Bridger, CFA, FRM, is Vice President, Analytics & Data at Fundata Canada Inc. This article is not intended as personalized investment advice. Investments mentioned are not guaranteed, involve risk of loss, and are subject to commissions.